The female is usually larger and can extend the tip of the abdomen to form the ovipositor used to lay eggs. Sometimes the male flies have a dilated eye that meet above the head. Flies are holometabolous, therefore they have four different morphological stages; egg, larva (maggot), pupa and adult. After hatching from the egg, larval molting twice as they grow. Molting maggot hard to see. Larvae are maggots with a soft body with no legs, and looks like a small keg. The larvae eat rotting flesh and feces. Adults fly eating sweets of any kind, including nectar (honey glands on the plant) and fruit rot. Lots of birds, bats, spiders, and insects such as dragonflies eat adult flies. Predatory and parasitic insects eat larvae. Eye flies are the most complex in the world of insects. each piece represents a separate unit detects light. Light reflected from the eye to form a rainbow fly. Flies smell, using feathers that cover their bodies. The feathers on the parts of the mouth and feet of flies are used to sample the food. Flies taste what they find to walking on makananya. If they run into something tasty, they will put their mouths and taste it again. Flies to use her hair to tell them when they touch something. These hairs will bend when touched. 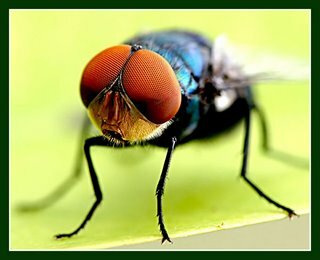 Eye flies do not have eyelids, so flies rub their eyes with their feet to keep them clean. A fly clean themselves constantly. Flies walk on smooth surfaces using a soft pad that acts like a glue stick. This allows them to walk up vertical glass surfaces and upside down. Flies and other insects, it is important to consume and eliminate dead animals. Flies are also important in the conversion of sewage and rotting vegetation to the ground. Flies fall prey to other animals. Some flies also help in pollination. Because they are interested in custom dirt and rotting meat, flies can also transmit diseases such as dysentery, typhoid fever, and cholera.